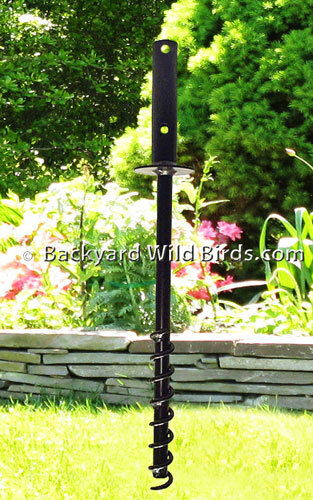 Bird Pole Ground Socket is for mounting 1 inch outside diameter bird feeder poles that slip into its 6" socket. This steel ground socket with cork screw can be turned into the ground 20 inches for a very stable platform. This provides a very strong steel anchor for all the poles systems in this category. It has a 1/2 inch turning hole that a large screw driver can be inserted for leverage, to aide twisting into the ground. The pole is turned into the ground up to its collar and the above ground socket accepts the pole shaft and has a set screw to lock in place. Allows the pole systems to have full height above ground. If in the future, you would like to move the pole system, you can simple turn the ground socket back out of the ground.